Hmm, with the left difficulty setting at A or B, it seems that the distance between the obstacles vary regardless. Is it a bug or is that more of a tendency thing? Don't worry, that's intentional - the space between obstacles is slightly randomized to make the game less predictable. Setting the difficulty switch to B simply adds a bit more space between the obstacles. I see. I was afraid in randomizing the ROM data thing in your last update, that spacing was also randomized. By the way, I like how you made a medium-length story to go with such a simple game like this, like with the Atari manuals back in the day. Edited by Tangentg, Mon Jul 4, 2016 8:11 PM. Just made the first Drive! cart and manual. 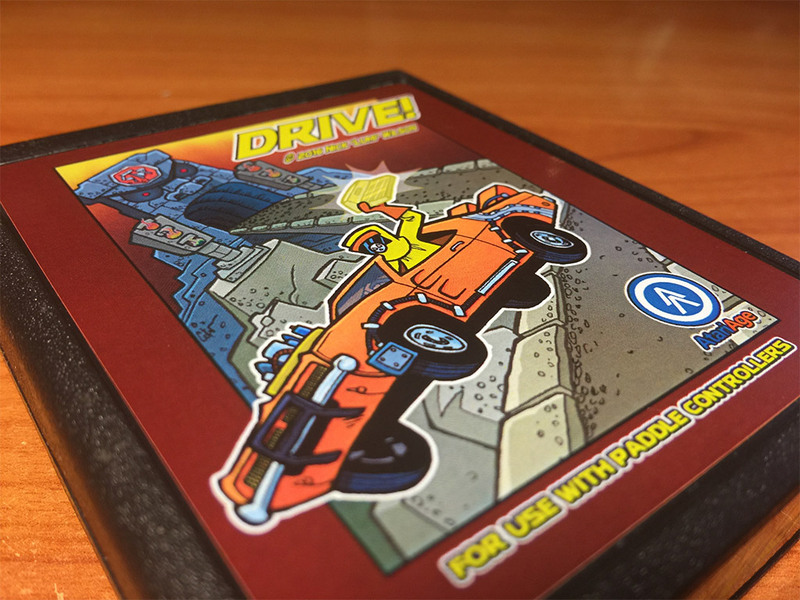 Coming soon to the AtariAge Store! I only just now saw the cover with the gold Atari 2600. That's a treasure I'd like to have, maybe even as a Monopoly token. I hope its not too late, but please add a box and let there be stated that its a Atari 2600 game.. ITs strange that most recent box arts ignore the hardware that its running on. Hi. Is there a preorder list, or is this gonna be mass produced and sold in the aa store? Edited by Sapicco, Sun Jul 17, 2016 12:03 PM. It's going to be sold in the store. With a box? And BTW There isnt stated anywhere that the game is from 2016. Most games got a ©201x on the cartridge label (or at the box art). And please put some hint that the game is for the Atari 2600 onto the box. No game would be released today anymore without the platform clearly printed on the box. This is awesome Albert. When can we expect the next store update? No box, sorry. 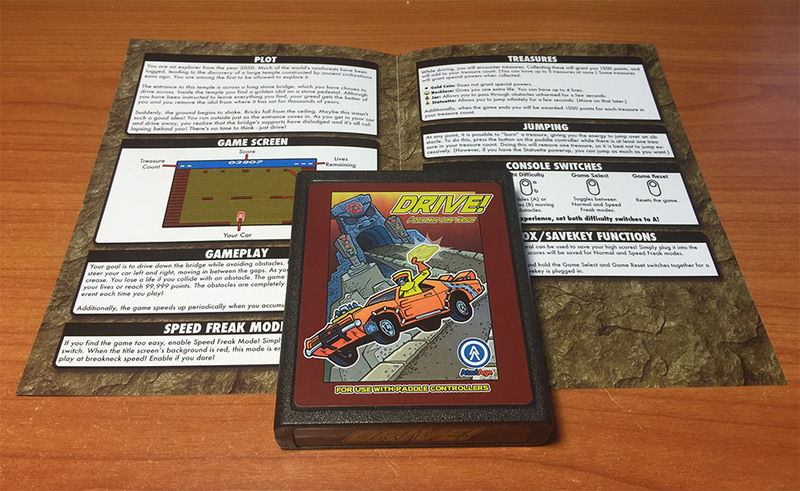 Could make a small run of boxes later, and if I do so, I will save some copies for people to purchase separately if they'd like a box after having purchased the cart/manual version of the game. The copyright is indeed on the label and manual--it's below the game's title. As for putting "Atari 2600" on the label, most of the games we've published over the years for the 2600 do not have "Atari 2600", "2600", or "Atari VCS" on the label anywhere. You're the first person to bring that point up, and it's not something I've really thought about in the past. I don't really think it's necessary for 2600 games, and I doubt I will start mandating it on labels in the future. Box or no box, I'm ready to support this one with my $. Hi, a box would be some real nice idea. And I also like the homebrew games which uses the original silver deisgn Atari used back then. And there Atari 2600 is clearly printed on the box. Take for exmaple the recent Playstation, Wii or Xbox games. Everyone of them clearly states the platform its made for. That would give it some serious look. 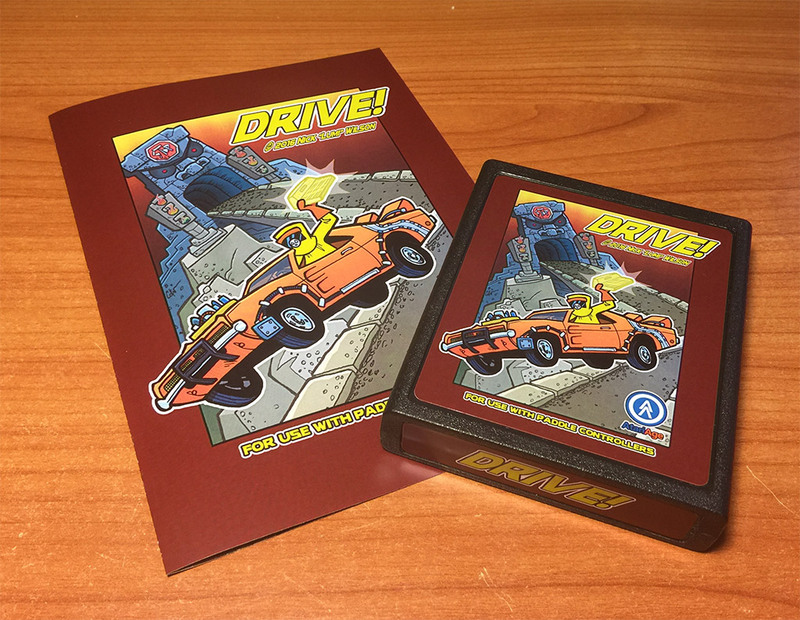 Bout the cartridge label art: Looks awesome. But for the box it would be nice to have it framed by the classic silver box . And thanks for the hint with the copyright on the label. Looks great! The quality of labels is amazing! I am actually the opposite. Unlicensed developers back in the day did not copy the styling of official Atari or Nintendo products. So I would prefer that Atari homebrews not copy the silver border boxart, and that NES or SNES brews not copy or spoof the Nintendo seal. But the real content is inside the package, so I base my purchases on what's inside, not the pretty label, boxart or packaging. With NES I wouldnt dare to fight with Nintendo with its horrible acting neither. But Atari is dead for a few decades. So noone out there woud give any attention at all for using the siler box art. And that way its more the real thing. And indeed the contenct is most important. But most of us were maazed by the amazing box art Parker or Imagic used back then. And you shouldnt forget: Thos games will stop working in a few decades. The box art will hold on for a few centuries. Thats why I dont understand at all, that there are collectors out there whom just collect cartridges. Thats not even half the game. Anyway: Silver box art or not. Using the platform name on a box art is given since many decades for consoles. So that should be the point where most of us could make some compromise i presume . I will buy it for sure too. Game conept looks nice. But I collect only games with boxes. So I wait for the box art first. Thats why I dont understand at all, that there are collectors out there whom just collect cartridges. Thats not even half the game. No, you're absolutely right: it's not half the game. It's the whole game! Boxes are just shelf fodder, and it is difficult to remove the games without damage so I have to store them separate. After three or four removals, the box lid is already dented. So I say save $10-$20 bucks by not purchasing the box if there's a loose option. Sometimes with homebrew, it's deluxe edition or bust; othertimes it's cart only or bust. So regardless of whether you're a CIB or loose collector, you gotta take what's offered, boxed or not. You will miss out then. But the box art makes the game. Think about Amidar without the cool box art. It would be just a dot moving on a grid. And having cartridges laying around is so .... 1980s . The box is really essential for the game. Especially with Atari VCS games with its simple graphics . But thats fine. One collector less which takes away offers on eBay. In both directions . I take it you're a shelf collector. Okay. I fail to see how the boxart makes the game if the whole purpose of a box is to house the contents (game). You wouldn't buy a cereal box at the grocery store without the cereal, would you? I get that boxes are pretty to look at. There is no denying it. I even own a sealed Wario's Woods I put in an acrylic case. But I have a loose player's copy of the game to play and there is no way I would collect the sealed case otherwise. The purpose of packaging is to attract the buyer. The actual game is to entertain. So if a homebrewer wants to sell a game loose in a baggie, I'm all for it. If a deluxe CIB homebrew is all that is made available, I'll buy that. If a nice guy like Albert gives us a choice, $30 loose versus $50 boxed, I will 90% of the time choose the loose one, because loose means I can afford more games, and less shelf space needed to display them. I'm running out of shelf space as it is, so extra clutter does not help matters much. Display it at your shelf ? So you are a shelf collector then . And I havent stated that I just like to get the box, but instead the cartridge and the box. And if its being sold wit the box at the usual $ 50 thats fine for me. And you also get your cartridge game for your shelf for $ 30. But one last question: What do you display at your shelf? Just black game cartridges with almost no art at all. And BTW Some Atari VCS games are almost 4 decades old. So the box has also the reason that you know what kind of game it is (beside searching it via Google indeed ). But in this scenario you see your games within the box, check the boxes and decide which game you like to play right now. 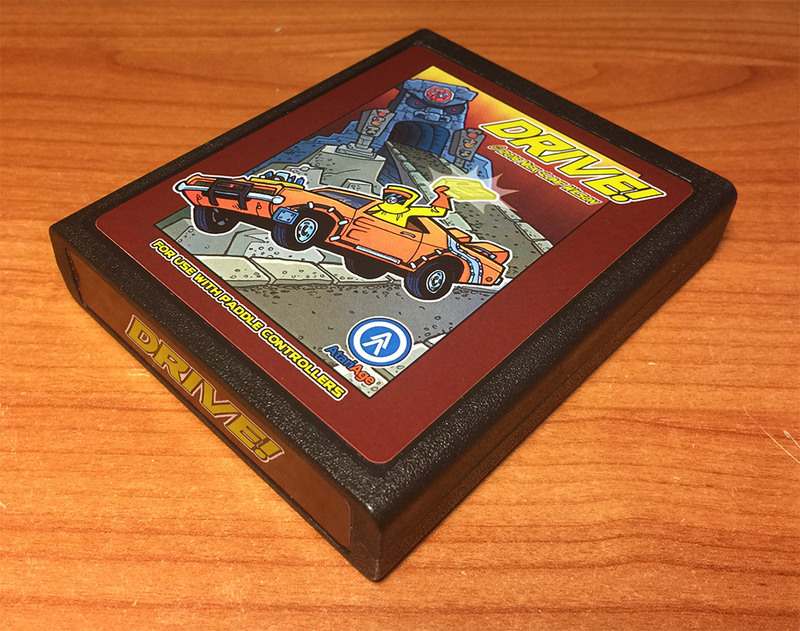 Do you display front out or spine though?seeing the top of an atari cart and spine of a box isn't much different as the spine of boxes aren't usually great. Good question . Usually just spine. But I see your point. But even then theres more information to see on the box. And with cartridges it appears so small. Its indeed a question of personal taste. My only point which seems to be valid for everyone is: In decades all we really got is the box. Without the box its just a piece of defective cartridge . And the other point: If you take a look at your collection its always cooler to look at the box to get an impressin of the game. And how it was presented to you bac then. But beside that, its indeed a matter of personal taste.